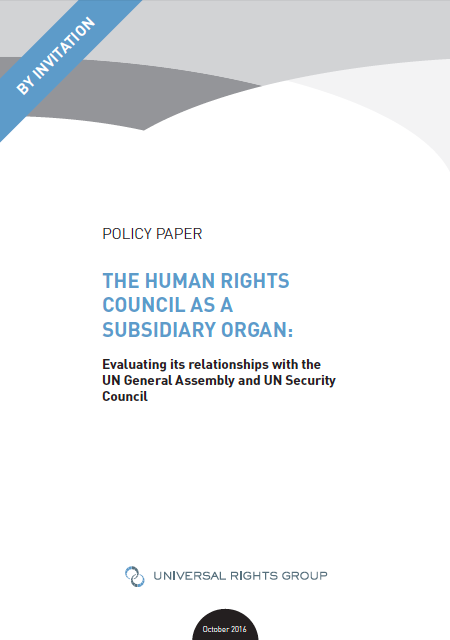 As the United Nations (UN) Human Rights Council (‘the Council’) celebrates it tenth anniversary in 2016, this policy paper aims to provide an overview of the institutional issues relating to its status as a subsidiary body within the UN system. In light of its subsidiary status, the paper explores the Council’s synergies and interactions with its parent body – the General Assembly (GA) – and the UN Security Council (UNSC). The paper addresses important questions regarding the structural positioning of the Council, its impact, and its potential for future growth within the UN system, including: What is the institutional architecture in which the Council finds itself, and how does it exert its influence to mainstream human rights within the UN system? To what extent is there overlap between the Council and other UN organs? What can be done to reduce bureaucratic overlap, and strengthen synergies, in regards to human rights work within the UN system?